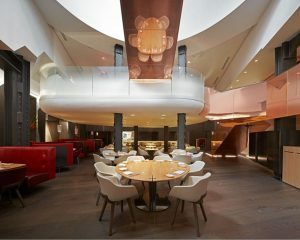 Casson Mann‘s design for Eneko at One Aldwych has won the award for Best restaurant in a hotel at the 2017 Restaurant & Bar Design Awards. The awards, hotly contested over thirty categories from best restaurant to best Middle Eastern & Aftrican bar, are judged by a team of industry-recognised figures and were presented at King’s Cross Events Space on 6 October. Casson Mann’s scheme was judged to be the winning scheme from a shortlist of seven entries that included the designs of the new Devonshire Club in London, Rofuta in Birmingham & Refuge in Manchester. The design of the restaurant necessitated a complete re-think of a difficult space: below ground in a corner of a large London hotel, with no access to natural light. The scheme created a grand staircase entrance to a mezzanine bar that floated over the restaurant below, giving a sense of spaciousness and airyness to a space that had had little of either before. Casson Mann’s palette of textures and materials reflected the heritage of chef Eneko Atxa’s Basque heritage, using local woods for the tables and ceramics typical of the area for wall claddings. DHA were engaged to provide the lighting scheme, including elements of concealed lighting so that diners are given the impression of being surrounded by natural light, despite being metres underground. Shane Holland Design was brought on board to create handmade suspended light fixtures over each booth table to a particular design by Casson Mann’s creative director, Roger Mann. This entry was posted in Awards, Recent work and tagged awards, Casson Mann, eneko, one aldwych, Restaurant on October 6, 2017 by jonathan. Casson Mann‘s exhibition design for the new WW1 galleries at the Imperial War Museum has won the best permanent exhibition category at the 2015 Museum & Heritage Awards. Judged by a panel of distinguished museum professionals, this award is keenly contested between some fantastic projects every year, so DHA was delighted when Casson Mann collected the award for their thoughtful and effective design, which has welcomed 1.4M visitors since it opened last year. 2015 – WW1 galleries, for Casson Mann. 2014 – Mary Rose Museum for Land, Pringle Brandon & WEA. Before this, we have had shortlisted projects in this category in 2009, 2010 & 2011. This entry was posted in Awards, Uncategorized and tagged awards, M&H Awards, winners, WW1 on May 1, 2015 by jonathan. 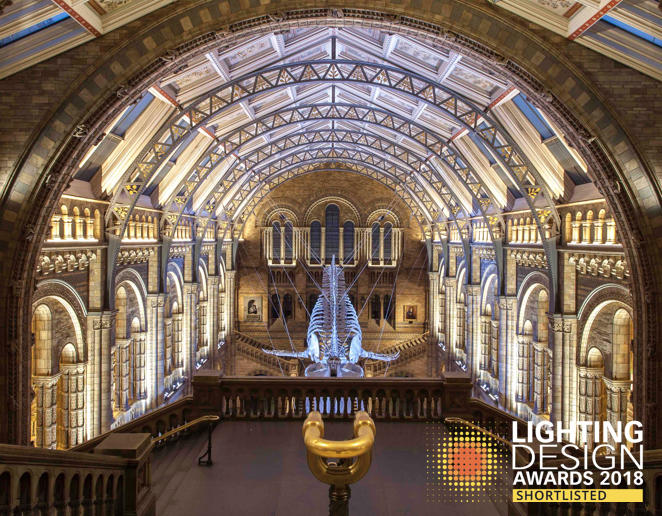 DHA were very happy to receive the Highly Commended certificate for the lighting scheme for Navy, Nelson & Nation at this year’s Lighting Design Awards. The shortlist of the Public Building category ran to nine projects, so the judges had a very difficult time determining the final winner (T2 at London Heathrow by Hoare Lea & studioFRACTAL). This entry was posted in All, Awards and tagged awards, dha, lighting design awards, public building on March 23, 2015 by jonathan.